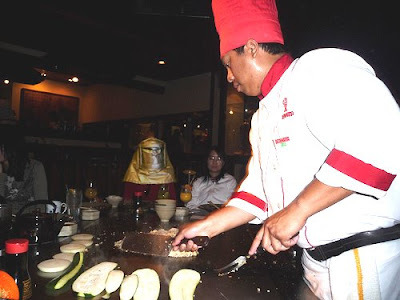 Zoltrog dined out last night at an establishment known as "Benihana." Their cuisine of raw animal meats was satisfactory, but Zoltrog took greater interest in Chef Matsuo. His handling of knives impressed even an 8th degree Makti-Ta knife handler such as myself. He would indeed make a fine addition to my royal guard. He will join or spend eternity slicing Troksonian eel on the fifth moon of Krabulack, mwahaha!